After 108 years of heartbreak, a Chicago Cubs fan in New Hampshire is celebrating the team's big World Series win. Hazel Nilson — who grew up within walking distance of Wrigley Field — now lives in Sunapee and stayed up to watch the Cubs beat the Cleveland Indians in extra innings early Thursday morning to win its first championship since 1908. It was the first she's ever witnessed. "Wow!" Nilson said, when asked how she was feeling. "I always had hope that someday they'd win, and by golly, they did." She was still feeling a bit tired on Thursday morning when necn spoke to her, but was basking in the glow of her team's World Series victory. 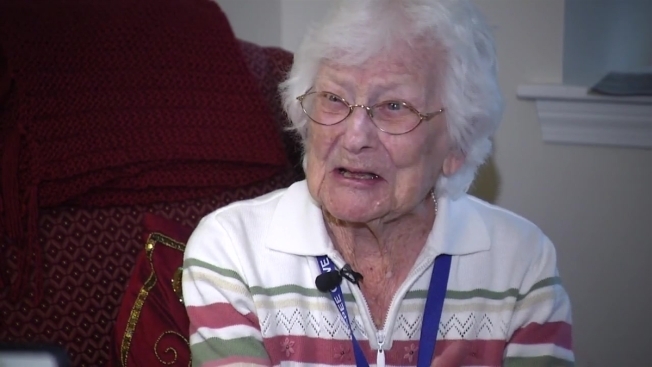 "It was a night I'll never forget," said Nilson, who watched Game 7 with her son, her grandson and friends at Sunapee Cove Assisted Living Home. "We were all rooting for the Cubs, and suddenly they had the hit that scored the run. We all yelled — I even jumped up!" She said she only wished she could have been in the clubhouse, even if it meant getting soaked with champagne. Nilson was born in Chicago on Aug. 21, 1908, just a couple of months before the Cubs last won the World Series. She moved to New Hampshire two years ago to live closer to her son. Some of Nilson's neighbors have already reached out to the Chicago Cubs organization suggesting that they should bring the World Series trophy to New Hampshire so she can see it in person.